The good news is BMW has decided to take a break from the convoluted naming scheme and brought back some letters that actually mean something...ZHP. The bad news is they gave it to the wrong car. BMW is putting out 100 units of the ZHP 435 coupe, although it hasn’t announced pricing. However, given that the car already has a starting MSRP of about $46,000, getting a ZHP equipped car for well into the fifty-grand mark is probably a good estimate. That will get you a slight power boost, a limited-slip differential and some M handling bits for considerably less than the M4. But all that hardware would be better suited (and most likely better appreciated) on a a less expensive model. The 2-series is arguably the best enthusiast oriented car BMW makes. It has a starting price of $32,100, which is about the same as the average transaction price of a new car. That puts the 2-series in striking distance for many buyers. You can even lease a well equipped example for about $330 a month. A 228 coupe with your choice of gearbox and the Track Handling Package will set you back only $35,250. Upgrade to the M-sport line and you are at $37,650. All BMW would have to do is add a limited-slip differential for around $1500 and you could have a ZHP 2-series for under forty-grand. Or suppose you wanted an “affordable” BMW, with excellent handling, but need the practicality of a sedan. Another possibility for the ZHP treatment would be the “Jalop Spec” 320i. With only 181 horsepower, the 32oi isn’t the quickest 3-series, but it will reach 60 in under seven seconds and for most drivers that’s plenty. Crank up the output to an even 200, add the M-sport suspension and the LSD and you could have a incredibly satisfying German sport’s sedan that harks back to the days when BMW performance cars were more about balance and finesse than raw power. A ZHP car is for the smart buyer who would like an M car, but needs to be more reasonable about their budget. The M models are wonderful, but they are big, heavy, have a crap-load of power, and are very expensive. Most of Jalops will dream about an M3 or an M4, but simply don’t have the means to put one in our driveway. The same goes for the 435; compared to the two-door coupes of BMW’s past, it is a fairly large car with a length 182 inches and weighing in at 3,600 pounds. The 4-series is meant for highway cruising, not track day antics. A ZHP model isn’t about buying an expensive badge for bragging rights, it’s for the driver who actually appreciates the “Ultimate Driving Machine” philosophy. 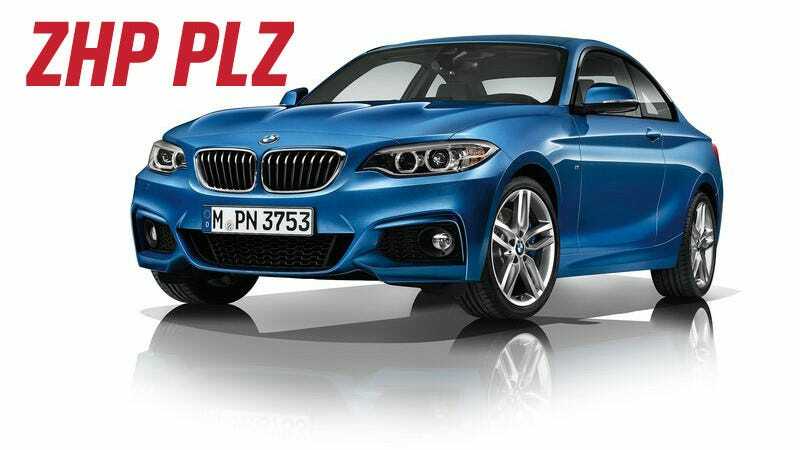 So rather than make the ZHP super exclusive and expensive, BMW may want to consider using it to re-capture those enthusiasts that say the brand has lost its way. Given the Audi and Mercedes are starting to seriously challenge BMW’s luxury sales dominance, accessible ZHP models is an opportunity to offer something special to those entry level customers.